This is one of my favorite houses we pass on the way to our little grocery store. 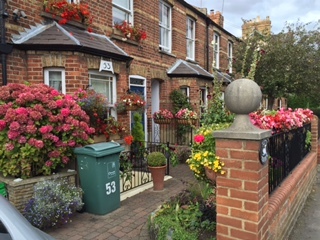 In recent days, in between our adventures farther afield, we’ve had a chance to wander our neighborhood a bit and sample a taste of the English life. Stone walls, pocked and darkened with time, abound. Church bells toll the hours. Traffic, confusingly coming from the “wrong direction,” whooshes along the main thoroughfares. But beyond those, on the narrow, winding residential streets, you can hear the mourning doves coo and the locals chat. On our walks, we pass aged row houses of brick and stone, some covered in stucco painted in cheery pastels. Many have little gardens out front; many others are being repaired and restored. They are, after all, very old. Our flat is in a building that dates to the 1870s. Others are several more centuries old. Beyond the hordes in the central city, we love the smaller scale and intimacy of this place barely a mile away. For groceries, we walk to the Co-op where we squeeze through crooked aisles to browse for the basics and a few delicacies crammed into every available niche. Along this street are small restaurants — Indian, of course, but Lebanese, Italian, Spanish and more. Pubs, too, quiet on weekdays, busy at night and on weekends. The post office is at the back of a little mini-mart stuffed with student fare (chips, pizza and the like) and an array of newspapers (they still read them here). We pass other shoppers, strollers, moms and dads with kids, lots of folks breezing by on bikes. 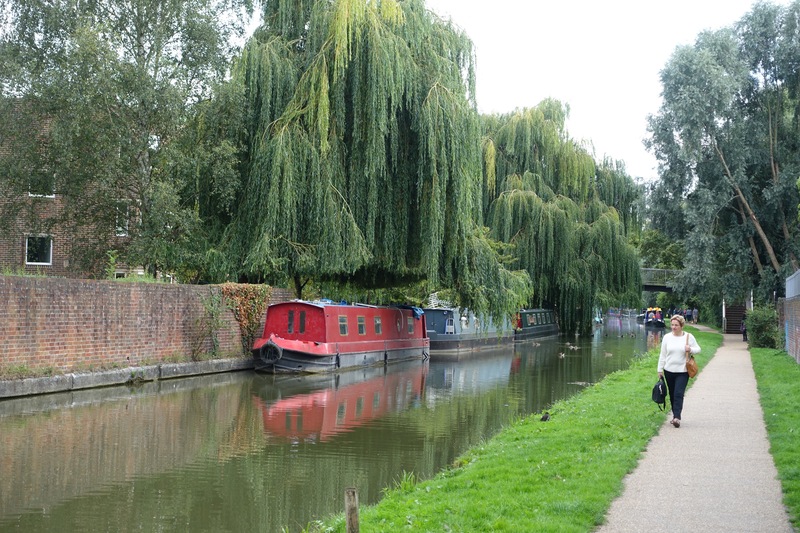 The Oxford Canal is a short walk from our apartment. Within a few blocks we can hook up with the Oxford Canal path, which we’ve explored only a little so far. Some people live in brightly decorated narrowboats along the water; you can rent some of the boats — we saw one young group partying under pirate flags. We went only a short way on our first outing, down to a wrought-iron bridge and a lock where the canal meets the Thames. We plan to visit the canal again soon, and walk miles up north following its trail. So many sorts of paths to follow here. Posted on September 5, 2015 September 5, 2015 by jbsaulPosted in Travel, UncategorizedTagged Oxford Canal.